Most of the product development work has been getting OneMusicAPI to a releasable state. The service has been in beta for a month or two now, while I improve the number and quality of matches and load-test the service to make sure that it works when the multitude descend. The work on OneMusicAPI is important because bliss is being updated to use the service for cover art search. While OneMusicAPI is not released, I don't want to release bliss, so that's why there has been a delay in bliss releases. However, I haven't just been working on OneMusicAPI, I've also had the chance to add some cool stuff to bliss in the meantime! 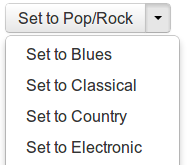 The first improvement are the addition of dropdowns for genre suggestions, as requested. The screenshot on the right demonstrates how the Set to button now has a little dropdown that allows any of your allowed genres to be chosen. If you click the Set to text itself, or any of the genres in the dropdown, the genre for the album/release gets changed. In the screenie above you might also notice the Save and Cancel buttons. I've changed the album detail page to only update data when Save is clicked as opposed to currently where data is updated when you edit a genre, year, album or artist name and then click away. This gives a more solid feel to the user experience. You might also notice the look and feel of the buttons is different. This is a wholesale change made across bliss to all buttons. There'll also be the normal load of bug fixes and more. I'm hoping that this new release will be out in mid February, so hang on until then! Thanks to Esther Gibbons for the image above.